TOKYO--(BUSINESS WIRE)--Wedge Holdings Co., Ltd. (Headquarters: Chuo-ku. Tokyo, Managing Director and CEO: Mr. Tatsuya Kinoshita) is developing Trading Card Game (TCG) "Haikyu!! Volleyball card game" for Southeast Asian Countries in their national languages. 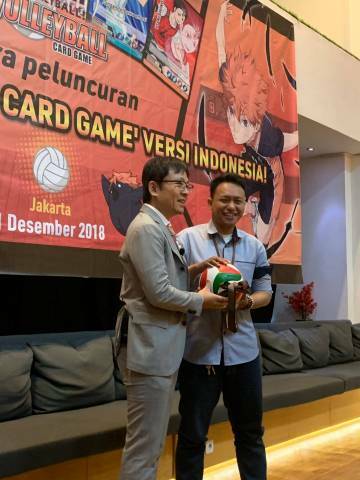 On 11 December 2018, Brain Navi Indonesia, our contents business base in Indonesia, held a TCG "Haikyu!! Volleyball card game" product launch event in Jakarta following the product release in Vietnam. We’re pleased to share the original press release in Indonesia. On 11 December 2018, at CoHive D Lab in Jakarta, Brain Navi Indonesia held the product launch event for “Haikyu!! Volleyball card game” into Indonesian market. This is one of the most popular trading card game in Japan, officially translated and introduced in Indonesia for the first time. Attending the event were enterprises in the entertainment industry and Indonesian domestic distribution partners such as Gramedia, blibli, Animart. TCG was created in 1993, then grew tremendously both in quality and quantity in Japan, and has become one of the flagship products of Japanese entertainment industry. The market size of TCG is estimated about JPY 100 billion and accounts for about 10 % of whole toys and games market in Japan. TCG is a fast growing market with famous titles such as Yu-Gi-Oh!, Duel Masters, Cardfight!! Vanguard, Weiß Schwarz, not only dominating Japan but being introduced in different languages to many countries also attracting an enormous number of players around the world. Players in Indonesia had hardly come in contact with official TCG products except one product so far. Most of them had to play with imported and copied from Japan and other countries. 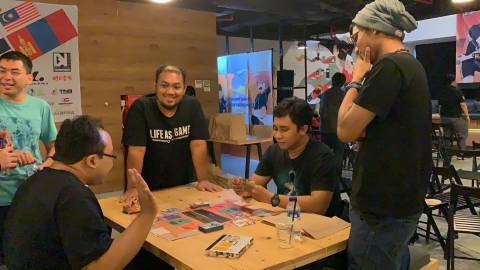 And due to lack of a licensed Indonesian version made for Indonesian, language barrier has been keeping many potential players from enjoying the game; therefore, Indonesia TCG market is still being overlooked. Realizing that practical need from Indonesian TCG fandom, Brain Navi Asia (under Wedge Holdings (Japan)) had acquired from Tomy Company Ltd. the license to develop and distribute TCG “Haikyu!! Volleyball card game” in 6 other languages. This time, we made it in Indonesia for Indonesian market. The highly interesting, intellectual, “Haikyu!! Volleyball card game”, being perfected from the translating step to design, edit, promises to satisfy the expectation of fan community, at the same time provides Indonesian youth with a new wholesome mean of entertainment. In the first release stage, Brain Navi Indonesia is selling the first Starter deck version Karasuno nationwide as below schedule. At the Product launch event, besides showcasing the main product “Haikyu!! 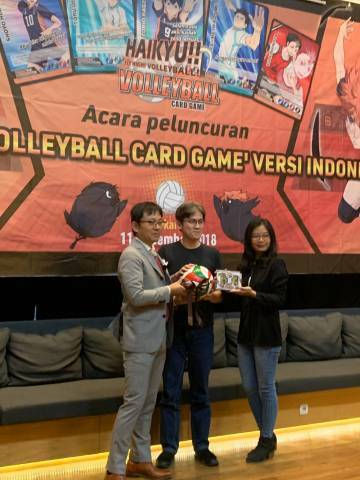 Volleyball card game”, Brain Navi Indonesia also presented business opportunities and projects from Brain Navi Asia for developing additional TCG products in Indonesia as well as Asia market. Also, at the event, guests had the opportunities to have a look at the Japanese, Vietnamese, and Indonesian versions of the “Haikyu!! Volleyball card game”. More than that, the game experiment corner allowed guests to watch and even join a real match in person to experience this fantastic game. Indonesia has 260 million population, the largest in Southeast Asia with high proportion of young generation. We expect the huge market there and the opportunities for us to make many potential fans excited from now on. Brain Navi Indonesia (BNI) is a brand name of the entertainment business in Indonesia handled by Wedge Holdings Co., Ltd., a listed company in Japan. BNI is aiming to distribute not only card game products, but also content license consulting and content licensing business through local distributor, and Japanese content products promotion in Indonesia. Established in 2001 in Japan as a member of Showa Holdings Group (Japan), Wedge Holdings Co., Ltd. is one of the leading companies in Japan and the world for developing and editing game products for famous Japanese brands such as Takara Tomy, Konami, Bandai. Listed on the JASDAQ Secuties Exchange. Haikyu!! Volleyball card game is a Trading Card Game released by Takara Tomy in Japan in 2014. It based on the famous Haikyu!! comic series written by Haruichi Furudate, having been published by Shueisha since 2012. The series is licensed in Indonesia by m&c! Publishing - PT Gramedia Pustaka Utama. Haikyu!! Volleyball card game had become very popular since it has grabbed the heart of the casual TCG players and become the best choice to play the “First TCG” and to enjoy the “Second Hobby” for Animation fans. Playing Haikyu!! Volleyball card game, the youth will feel they are now like the characters in Haikyu!! itself who knows the value of “Passion”, “Effort” and “Friends”. At the same time TCG make the users to get Strategic Thinking since it needed “Resource management”, “Planning” and “Execution” as well so that the users will get great simulation on business strategic thinking. “Haikyu!! Volleyball card game” is currently the only one Indonesian TCG released in Indonesia with full Copyright. Starter Deck : 40 cards, for beginners. Booster Box : 24 packs, each pack contains 6 cards to strengthen Starter deck.